Peter served with the TCHRD in India in Summer 2016. 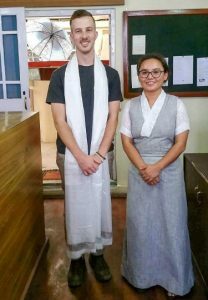 Through the TFI Fellowship Program, I spent eight weeks in Dharamsala, India working with the Tibetan Centre for Human Rights and Democracy (TCHRD). As a nongovernmental organization staffed entirely by Tibetans in exile, TCHRD plays an incredibly important role in monitoring, researching, and exposing human rights violations in Tibet to both the international community and Tibetans living around the globe. As a visiting fellow, I learned firsthand the intricacies of Tibet’s long and hard fought struggle to maintain its unique culture and identity in the face oppressive government policies. In collaborating with the TCHRD staff and other Tibetan human rights defenders, I grew to understand the remarkable courage and strength each one possessed to be in their position. I also had an opportunity to share my knowledge and expertise with them in a meaningful way by facilitating a three-day workshop on human rights monitoring, research, and advocacy. The interactive presentations drew the participation of staff members from TCHRD, the Tibet Policy Institute, the Active Nonviolence Education Center, and the Tibetan Women’s Association. In addition to carrying out my workshop, I drafted a report on arbitrary detention in Tibet for print and online publication. My experience was further enriched by working with a local monk to defend the human rights of slum dwellers at the Charan Khad slum in Lower Dharamsala. Tom Nazario, TFI’s founder and president, has prior experience working in Charan Khad, which is home to nearly 1,000 refugees from Rajasthan and Maharastra. At Tom’s request, I reached out to Jamyang, an amazingly gifted and compassionate Tibetan monk who has lifted more than 100 children of Charan Khad out of poverty through his Tong Len Hostel, which houses and provides formal education to each child. His efforts have been an incredible success. However, while I was in Dharamsala, the families of the Tong Len children – those who remained in the slum – faced the threat of forceful eviction at the hands of the municipal government. Jamyang and the older children of Tong Len were in the midst of a lengthy court battle to assert the rights of the slum dwellers when I offered my help. In the weeks that followed, I continued working at TCHRD but dedicated part of my time to building a successful legal argument in defense of the slum. This experience was impactful in so many ways. It not only gave me insight into the history of migration, resettlement, and slum dwelling in India; it offered me a glimpse into the absolute poverty that slum communities endure throughout the world, and it revealed a completely different dimension to life in Dharamsala – one in which local authorities ignore human rights and personal dignity when it is politically or economically expedient. Although the court system ultimately failed the Charan Khad community, I consider it a privilege to have worked on their behalf and I continue to collaborate with them on finding ways to use the legal system to protect them rather than harm them. My time as a TFI Fellow was filled with meaningful experiences that will have an enduring impact on my life and career for years to come. I gained an invaluable perspective on human rights in Tibet and I developed my professional skills by working at TCHRD. In working with the Charan Khad slum, I developed a deeper appreciation for legal protections for the extreme poor. From both experiences, I drew constant inspiration from the courageous and selfless people who dedicated their lives to helping the impoverished and oppressed. I am tremendously grateful to TFI for providing me this opportunity and I recommend it to anyone who wishes to make a meaningful impact on human rights and broaden their international and professional experience. We haven't posted in a while. Here's a quick update. Tom Nazario is traveling this week to show our award-winning documentary "Living on a Dollar a Day" to students at three high schools in Los Angeles, CA and Sedona, AZ. Hoping the young people like our film and take some inspiration from it! Next week he will visit our 5 sponsored students in Ghana as well as their Orthopedic Training Center which works to give physically disabled children opportunities for independence. Heartfelt Thanks on this Valentine's Day! As the film festival circuit winds down for our film, "Living on a Dollar a Day," we are still humbled and surprised to be selected for screenings. This Saturday, we will be one of the documentaries featured at Cinema On The Bayou Film Festival in Louisiana. Alexa, explain to me why AOC's 70 percent marginal tax rate is so popular. Wishing You a Bright New Year! Make Your Year-End Gift by December 31st! Wishing you the blessings of the season! The Forgotten International updated their cover photo. The Forgotten International shared a photo. Catch "Living on a Dollar a Day" When It Comes to City Near You! More festival news: Thank you, South Carolina and Attention UK friends! "Living on a Dollar a Day" screened in Greenville, SC this past weekend at the Reedy Reels Film Festival. It was attended by at least 20 members of the Atlas Club from Riverside High School whose members have been helping TFI's international programs for years. Thank you to Anne Westkaemper Snow, faculty supervisor of #AtlasClub for representing TFI at the festival. We are so honored to get this news from McLeod, India! Our film "Living on a Dollar a Day" won Best Documentary and the Special Jury Prize at the Free Spirit Film Festival! This is a special feeling for us because we do some of our work in the community and have been traveling to McLeod since 1999 (Tom) and 2004 (Jennifer). We're so happy the community received our film so warmly. We received a very kind review from a friend who attended the Free Film Festival in McLeod, India, where our film, "Living on a Dollar a Day" was screened on the final day. He says in part: "People were saying the last film touched and inspired them. Loved the theme and felt sympathy for those deprived." This is so cool! Our film "Living on a Dollar a Day" will be screening at this festival in India on Wednesday evening, 31 October. We are thrilled as Dharamsala and McLeod Ganj are close to our hearts and where we do some of our work. We cannot be there, but we hope our good friends can go and bring their friends.Thank you Free Spirit Film Festival for selecting our film! We hope your audience enjoys it. A big THANK YOU to Chef Ross Hanson of Oak & Rye! He prepared a special meal for a private event we held in Saratoga this weekend. People couldn't stop talking about the food! His restaurant is Los Gatos. If you are in the neighborhood, stop by for lunch or dinner. You won't be disappointed! The Forgotten International shared a live video. We are honored to learn our documentary, "Living on a Dollar a Day" is up for an award next weekend at Commffest global community film and arts festival. The festival runs from October 10 to 16 in Toronto, Ontario, CANADA. Friends in Toronto, you are welcome to attend the festival. Our film is screening on Friday, October 12. No advance tickets required. Details are below. The Forgotten International shared a post. So pleased to see these two amazing women at our offices today! Last time we met was in the spring at Project Pearls in the Philippines where Melissa Villa (R) and Karen Viel Beblañas (L) showed me the important work they are doing with some of the poorest families in Manila. TFI is proud to support their efforts in education, nutrition, and basic healthcare to hundreds of women and children. They kindly presented TFI with a Certificate of Appreciation, which we will treasure! Bay Area friends, if you haven't had a chance to check out the "Living on a Dollar a Day" photo exhibit at the San Francisco World Affairs Council, it runs through October 4th. 1st Annual NYC 2 Paris International Film Festival-Paris Session starts tonight with their first batch of amazing films! Tickets are FREE! There's a great film being shown tonight called "And Then They Came for Us" featuring George Takei and Paul Kitagaki Jr.
Our film, "Living on a Dollar a Day" featuring Renée C Byer will be screened tomorrow (Friday) at 7:00 PM. A big thank you to NYC2Paris Film Festival for adding "Living on a Dollar a Day" to your schedule in Paris THIS Friday. This is so exciting! I attended the NYC session a couple weeks ago and saw some amazing films, including "Nothing on Us" also featured. I wish we could make it to Paris, but since we cannot, we are hoping our Paris-based friends can attend the FREE film festival. Please share this post far and wide with Parisian friends and family, and let us know if you end up going! www.aucafedeparis.fr/frWe are pleased to announce that two of our brilliant documentaries, originally scheduled just for NYC, will now be featured in Paris! "Living On A Dollar A Day" New York Screening! Much thanks to Dennis Cieri, Director of @nyc2parisfilmfest "Living on a Dollar a Day" was warmly received, and i met some awesome people who want to talk about future projects 🤷🏻‍♀️ Stay tuned! More Awards and Screenings for "Living On A Dollar A Day"! NYC friends and family! Jennifer from TFI will be at the NYC 2 Paris Film Festival on Sunday, September 9th. If you want to check out a film festival and see some talented filmmakers debut their work, please let us know you will be there. We would love to say hello and thank you for supporting ours and other independent films! It would be great if our NYC friends could attend. We appreciate your comments and feedback!Based on the making of the award-winning book, Living On A Dollar A Day follows the work of Pulitzer Prize-winning photojournalist Renée C Byer as she explores the personal experiences of women, children, and families who live in extreme poverty in ten countries around the world. Her acclaimed images, along with the book’s author, Professor Thomas Nazario’s knowledge of the causes and effects of poverty, as well as other experts in their respective fields, help tell the stories of the daily lives of the poor. Tonight in NYC! The Chain NYC Film Festival is screening "Living on a Dollar a Day". Hope some of our NYC friends can come out to support the festival. Tickets are $10 for a block of short films in their "For Humanity" category. Sorry we can't be there with you. #LivingOnADollarADay also won for Best Editing! Congratulations to our amazing video editor, Karlo Gharabegian!!! Tom Nazario is on a plane to London today to attend the Beliff Film Festival 2018 where they will screen "Living on a Dollar a Day" at the Phoenix Cinema this weekend, August 10, 11 and 12. Our film is in the 1:30 pm (13:30) block on Sunday, August 12th, but there looks to be a lot of talented filmmakers debuting their films over the weekend. We are honored to be included! London friends, hope you cab support the festival and say hello to Tom.and finally... the much expected BELIFF 2018 trailer. #Congratulations to ALL HEART for being featured on Hallmark Channel USA. "Living On A Dollar A Day" Screening! BELIFF 2018 Official Selection !!! The Forgotten International is a 501(c)(3) non-profit organization. Our tax identification number is 26-1484826. All donations are tax deductible to the fullest extent of the law.